You’re just a random girl with a common dream. You know you’ll be misunderstood. Like a relentless housefly on a hot summer day, he’s the pesky accuser, forever seeking to edge his way between our head and our heart. He holds court, as if the “Truth, whole Truth, and nothing but the Truth” would entertain his arguments. Satan–father of lies, counselor of confusion. Oh for a pest-deterring screen door on the foyer of our minds. Amen? The sandal-wearing, dusty-footed flesh of God steps right through the pages of Matthew, looks us square in the spirit, and draws us into the scene. With one simple directive, Jesus hollers, “Order in the court”, authoritatively dismantling Satan’s case. Sitting cross-legged, shade trees stretched green above, He warmly huddles the disciples around His weary flesh. Leaning in, he urges them to glean by the armloads these private treasures He’s imparted. Oh, the timeless beauty of the Living Word. A mandate from antiquity catching us up in its tide as our generation carries the whispers of a Savior on to the next. Still huddling us close, He speaks into our lives in personal ways—advancing His Word from the gables of our times. And doesn’t Satan just love it when we question our ability to discern the Divine Whisper? If he can get us to believe the paralyzing, “You have nothing to offer” lie, he renders a jury of onlookers deaf to our testimonies, removing our witness from the stands, leaving weakness and inadequacy to falsely testify in our stead. Oh, but, take heart! The pesky accuser’s been overruled by one confounding, yet crucial, fact—our presumed lack is the very thing that enables us, for God’s power is made perfect in our weakness. Whatever He’s uniquely whispered into your spirit—don’t be afraid to stand in that calling. Boldly speak His heart from the risers of your life. Satan has no authority in the courthouse of your calling. Your qualification isn’t found in worldly measures, but solely in the One who took you aside, graced your cheek with the warmth of His breath, and invited you into the adventure with Him. Oh how the enemy whispers in our ear and wants to discourage us. What a wonderful reminder that our presumed lack is actually what enables us. We may feel like we don’t have what it takes…that’s how Moses felt, and look what God was able to do through him. Thanks for the encouragement that we don’t have to give the enemy a voice in our calling. God’s voice is the only one that matters. Our lack can be consuming sometimes, can’t it? Thank you for the encouragement here, today! Happy Thursday, from the Chasing Community Linkup! This post brought such confirmation to my own thoughts today. This here spoke deeply > ” Oh, the timeless beauty of the Living Word. A mandate from antiquity catching us up in its tide as our generation carries the whispers of a Savior on to the next.” I am so very grateful for the flawless Word we have been given. May you have a blessed Thursday! What a great post – the enemy messes with us and we fall for those lies those accusations. NOT TRUE -we are daughters of the most high God and dearly loved. Thanks for the reminder. Beautiful, BEAUTIFUL encouragement, Brenda. That verse from Matthew? Girl, my head was nodding feverishly in agreement. It’s similar to the unction the Lord has given me for ministry – “Look what the Lord has done!” I love reading your words. Good stuff! Who do I think I am? I’m His! Lisa/Syncopated Mama recently posted…Peg + Cat: A Totally Awesome Way to Introduce Math to Your Preschooler! I love this. Voice is my word for the year and your post covers so many aspects of that: choosing to fight against the voice of the enemy, listening to God’s voice as he whispers to us and then being bold in speaking out when he asks us. Brenda….your words were “timely” for me today. It’s been one of those “why bother?”…”who cares?”…”little ole me pity party days”. What a sweet reminder that I am called and I can silence the voice of the enemy. So good, Breanda! Thanks for reminding me and all of us, that the only thing that matters is His calling. 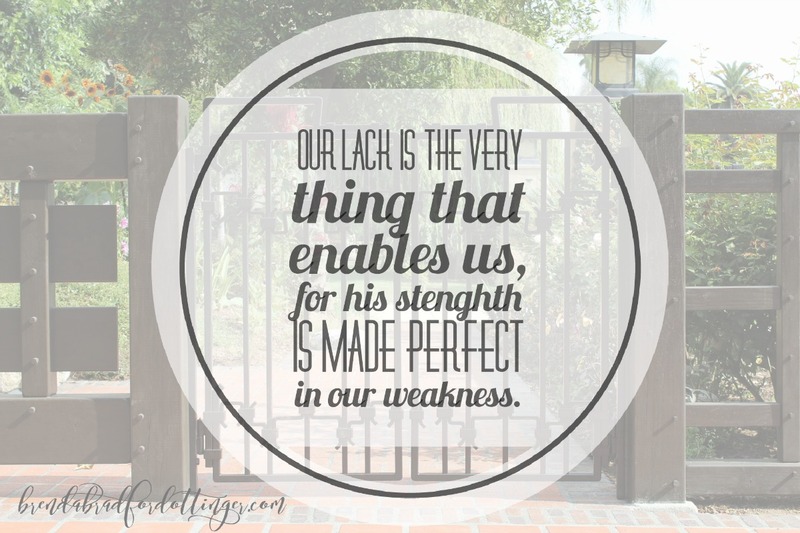 Our weakness is exactly where He’ll speak for us to live out our calling. Wisdom and encouragement here, my friend! I love this quote, “our presumed lack is the very thing that enables us, for God’s power is made perfect in our weakness.” It’s so true! Thanks for hosting this linkup! You’re doing a great job!!! Oh boy, this post hit home. The enemy screams so loud in my ear sometimes I am almost positive it must be true. We must learn how to decipher the voices. Maree Dee recently posted…How Does One Trust God In All Circumstances? This was such an encouragement to read this morning, Brenda. “Father of lies, counselor of confusion” – isn’t that the truth. Love the reminder of 2 Corinthians 12:9.